3,215. That’s the number of transactions of private homes in the 1st quarter of 2019, based on caveats registered to date in URA Realis. This is a sharp 40 per cent drop from the 5,328 recorded a year ago, noted by JLL Singapore’s senior director of research and consultancy Ong Teck Hui. Well, that’s really only half the story. If you breakdown the numbers, you’ll find that most of the drop is attributed to the secondary market. The official Q12019 numbers aren’t out yet, but just take a look at this from URA’s Q4 update. Primary sales i.e. new launches, dropped only 1.5% year on year, while resale transactions dropped a whopping 53.4%! Does it seem like when the market is slowing down, resale units are hit harder than developer’s new launches? Yes and No. New launch figures can be skewed because of developer’s launch schedules. However, in my opinion, New Launch Vs Resale Condo buyers belong to different categories. They weigh aspects of a property purchase differently. 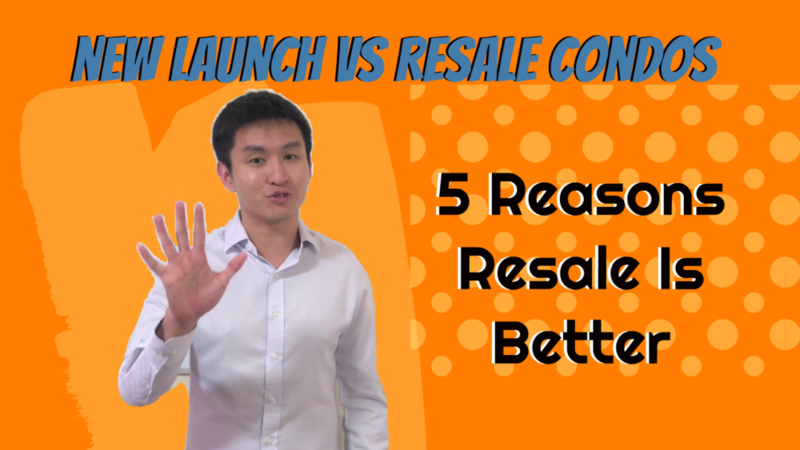 So in the first of many in a series on New Launch Vs Resale Condos, I want to start with the 5 reasons why a resale condo is better. Since there are so many agency sales people pushing new launches, let’s give the older resale sibling some love! Probably the number 1 reason why buyers prefer older resale units. A. So that the overall quantum of the unit is still affordable. When price per square foot (psf) increases, decrease the size to maintain the overall quantum. B. So that they can sell more smaller units and have a higher profit margin as the smaller sized units tend to have a higher psf compared to the larger units. It’s no wonder we see so many new developments with a large proportion of units being 1 to 2 bedders. However we would expect to see changes in this trend due to government intervention in Oct 2018, where they increased the minimum average size requirement. In the meantime though, if a 1000sqft 2 bedroom or a 1500sqft 3bedroom are the kind of living space you fancy, then you would likely look towards a resale unit. Unlike the showflat models by developers which are dressed to the nines with design elements to excite you, the resale unit is the actual, completed product. While it is unlikely to look nearly as attractive as the showflat, you know that what you see, and what you feel, is what you get. In sales brochures or showflat models it can be difficult to estimate things like block to block distance, whether your view would be affected, the amount of noise pollution, the view, etc. If you need this peace of mind, and find it difficult to buy off plan, then resale properties are for you. Do note that resale buyers fall under the caveat emptor principle, which is Latin for "Let the buyer beware". There are no defects liability period such as the ones given by developers within the 1st year of TOP. Once the deal is done, all responsibility is transferred to the buyer! For investment buyers, this reason comes up top. “$1,900+ for a new launch condo in location Y? Might as well get an old one at $1600psf, the new one is so overpriced! Some more it’s 99-years leasehold!” – said not just 1 buyer. For small shoebox unit investors, the quantum has also been creeping up. While years back you could get shoebox units for as low as 3XXk, with awesome rental yield, the lowest priced 1bedders at mass-market condominiums now cost a minimum of 500+k. Comparatively, the older resale units do not just have a lower psf, but are also more palatable in quantum. The Real Question, Lower priced = better for investment? We Singaporeans have a reputation for waiting in line for everything. Food, sales, travel fairs, IT shows… they’re full of those long snaking queues. For Real Estate though, sometimes people want it now. A new launch can take 3 to 6 years to complete, depending on manner of construction and whether it’s a government land sale or enbloc project. That also means 3 to 6 years of mortgage payments without any return. Comparatively, a resale project is immediate. Which means right away, once the sale is complete, you can either move in, enjoy the facilities, or lease it out, and enjoy immediate rental returns. You’ve probably seen condos with tennis courts. But what about badminton courts? Along with rock climbing walls, foot reflexology paths, and even saunas, such facilities are becoming rarer and rarer due to space constraints, low usage and high maintenance costs. Credits to 99.co who have a more detailed article on this topic which you can read here. The New Launch Vs Resale Condo debate is a never ending one. There will always be people on either side of the fence, or on it. If you’re a resale buyer, which of these 5 reasons is your reason? Next in the series, we’ll have our attention back at the New Launch segment to see the 5 reasons why New Launch Condos are better. If you like my content, do subscribe!